Live, Laugh, Love - and Scrap! : A clean house is the sign of a lazy scrapper. A clean house is the sign of a lazy scrapper. Scrapbooking is my happy place. I can't help it, it just is. There are times we all need to just close our eyes and go to our happy place. I close my eyes and think about new scrapbook pages, new greeting card ideas, and so much more. I can get lost on Pinterest and the pages that are posted there for hours. It's fun - I mean, really fun! However, there are some things that can mess with my happy place, and I'm sure that you and I share some of them. For example, if you don't have enough time, you find yourself procrastinating until you find the perfect time with the perfect idea, which leads to weeks, months, even years of getting nothing done. 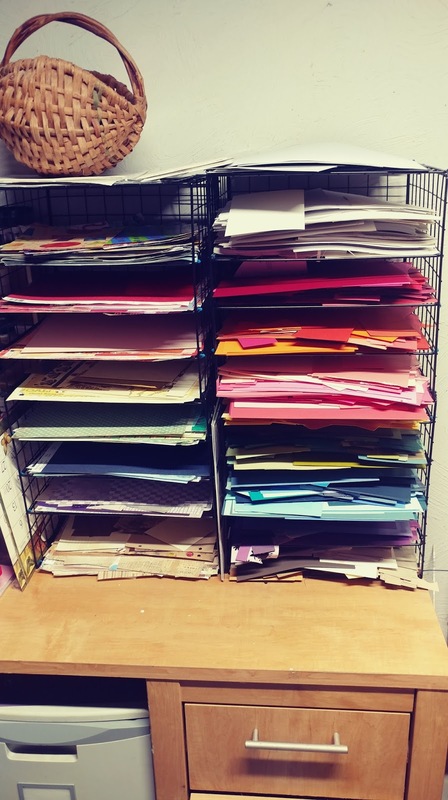 If you are trying to scrap on a budget, the lack of variety you think you have because of a (temporary) inability to get many accessories and/or tools can turn parts of scrapbooking into a chore. Who needs that? No one. Exactly. I have some ideas that might help. works, what doesn't, what could work better, and what organization tools I need. It's been worth it, however, because I am likely to scrap much more when my area is kept reasonably cleaned up. Organization saves LOADS of time AND money. How it saves time is pretty obvious - like I mentioned, I love to carve out as much time as possible to scrap. That is easier if my area is reasonably straightened up, so I can jump right in when I do have the time. It keeps things (somewhat) stress free, especially w/o having to search for everything, so I enjoy scrapping much more. And it means I don't have to set hours aside; I can do half an hour here and there if I need to. more, so he gave it to me. me to see what is inside. But saving money? 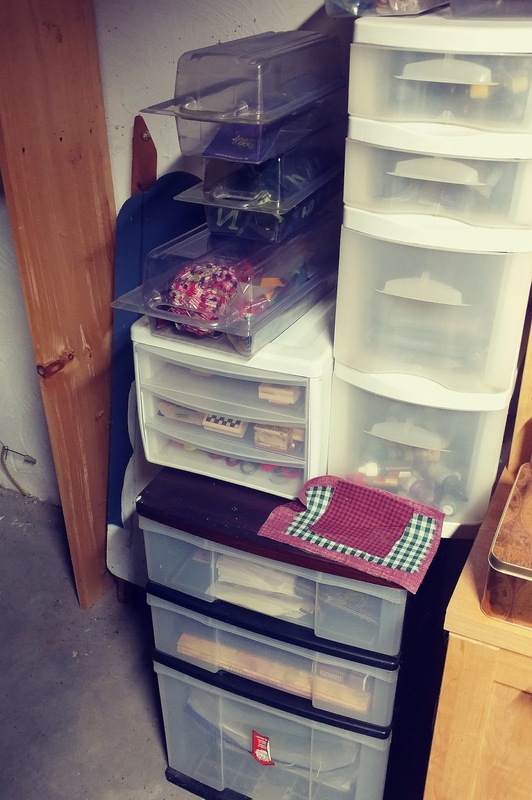 That might not be so obvious to some, but think about this - if you are constantly forgetting and losing supplies you already have, you're likely to buy them again, only to find what you just bought is deep in the clutter of your crafting life. Again, who needs that? Every so often, I find that for one reason or another, I need to do an overall reorganization and clean up my craft area. It is such a pain, but it is helpful, and even fun, to be reminded of all the cool things I already have. I have more designer paper than I realized, tons of great accessories, and even tools that I may have forgotten about. Since I've been making time to scrap, I learn what works and then figure out more/other systems, tools, and designs that might work better. I have a fairly large craft area in my basement. My husband has a similar area for his hobby. In that way, we are blessed. Yet even with plenty of space, it is so easy for a mess to develop quickly, and it's even easier and quicker for that mess to get out of control. For me, especially when I am on a roll and trying to get some things done, it's like - I use this, set it aside; bring out a bunch of samples or ideas, decide on one, set the rest aside; spot something I'm pretty sure I'll use soon, bring it out so I'll see it and remember. The next thing I know, I've got piles here and there that I keep digging through to find the scissors, the glue stick, or whatever else I need next. 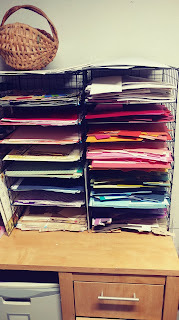 Then I shove it all aside to use the paper cutter... Yeah, not hard at all to quickly feel overwhelmed with the scraps of scraps! It's almost a daily struggle with me. But I LOVE to scrap, so if I feel too overwhelmed to do it often, it affects everything else in my life, including my mental and spiritual health. In the past, there have been times, that I have let my desk/area, and therefore my scrapping, go for so long that thinking about it makes me crazy, so I try to ignore it - unsuccessfully, of course. So, the motivation to scrap more helps me to (try to) stay clean and (somewhat) organized.